Magic™ Fc Receptor Blocker can be used as a blocking agent to block Fc receptors present on hematopoietic (blood derived), lymphoid cells/tissues and tumor cells and cell lines. The binding of the Fc region of the primary or the secondary antibody to the Fc receptors present on the surface of leukocytes (white blood cells) or tumor cells gives rise to non-specific binding and is observed as background or non-specific staining in IHC, fluorescence and flow cytometry assays. 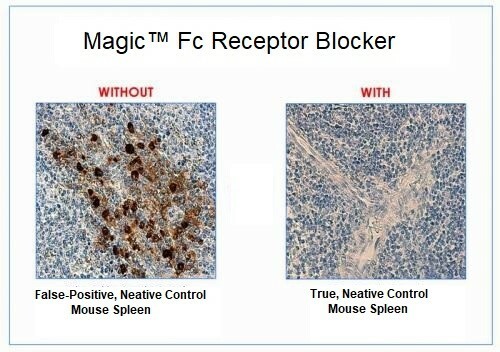 Magic™ Fc receptor blocker (Azide-free) does not contain sodium azide or thimerosol and it is therefore suitable for effective blocking of Fc receptors in non-fixed live cells of lymphoid and hematopoietic origin as well as tumor cells and cell lines that carry Fc receptors on their surface. Azide-free Fc Receptor Blocker is especially helpful for blocking Fc receptors in tumor cells or cell lines employed in functional assays where sodium azide and other preservatives cause endocytosis and result in cytotoxicity and cell damage. Universal Fc Blocker - applicable to Blocking all types of Fc receptors such as Fc-gamma receptors of type I, II and III; Fc -epsilon receptors type I and II; Fc –alpha receptors, Fcα/μR and FcRn in all-species including human, mouse and all-animal species cells and tissues. Multiple Applications - can be used to block all types of Fc receptors in a variety of Immunoassays such as IHC, Immunofluorescence (IF) and Flow cytometry. Ready to Use - 30 minute incubation step at room temperature for human tissues/cells; 45 minutes to 1-hour incubation for animal tissues/cells. Synthesized Peptide - Does NOT contain antibodies, Immunoglobulins or immunoglobulin fragments. Fc receptors are glycoproteins of approximate molecular weights of 50-70 kD. They are expressed by many different cell types in the immune system, and their interaction with antibody can initiate a broad spectrum of effector functions that are important in host defense. These functions include phagocytosis of antibody-coated microbes, lysosomal degradation of endocytosed immune complexes, antibody-dependent cell-mediated cytotoxicity, secretion of cytokine and chemokines, release of potent inflammatory mediators, enhancement of antigen presentation, and regulation of antibody production by B lymphocytes, and plasma cell survival. Fc receptors (FcRs) are key immune regulatory receptors connecting the antibody mediated (humoral) immune response to cellular effector functions. Receptors for all classes of immunoglobulins have been identified, including FcγR (IgG), FcεRI (IgE), FcαRI (IgA), FcμR (IgM) and FcδR (IgD). There are three classes of receptors for human IgG found on leukocytes: CD64 (FcγRI), CD32 (FcγRIIa, FcγRIIb and FcγRIIc) and CD16 (FcγRIIIa and FcγRIIIb). FcγRI is classed as a high affinity receptor (nanomolar range KD) while FcγRII and FcγRIII are low to intermediate affinity (micromolar range KD). Non-specific Fc receptors staining in assays such as IHC, Immunofluorescence (IF) and flow cytometry can result from the binding of the Fc region of the primary and secondary antibody to the Fc receptors on the cells. Eliminating Fc receptor staining is desirable in IHC, IF and Flow cytometry.